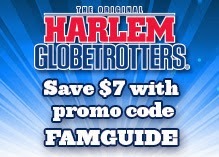 The Harlem Globetrotters are coming to Calgary April 23rd! The kids were off for Spring Break last week and I'll have an update on that Wednesday, but I wanted to get the news out on this fun event happening next week in Calgary! April 23rd, 2015 at 7pm! The iconic Harlem Globetrotters bring their unrivalled family show to the Saddledome, featuring some of the greatest athletes on the planet! With incredible ball handling skills, amazing rim-rattling dunks and trick shots, side-splitting comedy and unequalled on-court fan interaction, this must-see event is guaranteed to entertain the whole family. 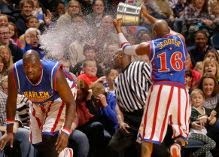 The Globetrotters will face the Washington Generals, the last team to beat the Globetrotters in 1971. Now coached by a former member of that team, they are on a mission to do whatever it takes to win, including a new strategy to give the Globetrotters a run for their money.